Estrogens play an important role in the regulation of placental function, and 17-beta-estradiol (E2) production rises eighty fold during human pregnancy. Although term placenta has been found to specifically bind estrogens, cellular localization of estrogen receptor alpha (ER-alpha) in trophoblast remains unclear. We used western blot analysis and immunohistochemistry with h-151 and ID5 monoclonal antibodies to determine the expression and cellular localization of ER-alpha protein in human placentae and cultured trophoblast cells. Western blot analysis revealed a ~65 kDa ER-alpha band in MCF-7 breast carcinoma cells (positive control). A similar band was detected in five normal term placentae exhibiting strong expression of Thy-1 differentiation protein in the villous core. However, five other term placentae, which exhibited low or no Thy-1 expression (abnormal placentae), exhibited virtually no ER-alpha expression. In normal placentae, nuclear ER-alpha expression was confined to villous cytotrophoblast cells (CT), but syncytiotrophoblast (ST) and extravillous trophoblast cells were unstained. In abnormal placentae no CT expressing ER-alpha were detected. Normal and abnormal placentae also showed ER-alpha expression in villous vascular pericytes and amniotic (but not villous) fibroblasts; no staining was detected in amniotic epithelial cells or decidual cells. All cultured trophoblast cells derived from the same normal and abnormal placentae showed distinct ER-alpha expression in western blots, and the ER-alpha expression was confined to the differentiating CT, but not to the mature ST. Trophoblast cells from six additional placentae were cultured in normal medium with phenol red (a weak estrogen) as above (PhR+), or plated in phenol red-free medium (PhR-) without or with mid-pregnancy levels of E2 (20 nM). Culture in PhR- medium without E2 caused retardation of syncytium formation and PhR-medium with E2 caused acceleration of syncytium formation compared to cultures in PhR+ medium. These data indicate that the considerable increase in estrogen production during pregnancy may play a role, via the ER-alpha, in the stimulation of CT differentiation and promote function in normal placentae. This mechanism, however, may not operate in abnormal placentae, which show a lack of ER-alpha expression. Estrogenic steroids regulate cellular function in a wide variety of tissues . During human pregnancy, the production of 17-beta-estradiol (E2) rises eighty fold, from 0.75 nM preovulatory peak to 60 nM at term [2–5], and estrogens influence various aspects of placental function and fetal development in humans and primates [6–12]. Several previous studies have shown that human placenta binds estradiol [13–15]. However, more recent immunohistochemical studies on paraffin-embedded or snap frozen sections as well as other techniques (RT-PCR for ER-alpha mRNA) failed to demonstrate estrogen receptor alpha (ERα) in human placentae during pregnancy or in cultures of dispersed placental cells [16, 17]. However, it has been indicated that the failure to detect the ERα does not entirely preclude the presence of this receptor in human trophoblast cells, but might be attributed to a relatively low number and density of ERα molecules on these cells . On the other hand, Billiar et al. reported identification of the ERα in the nuclei of cultured human placental syncytiotrophoblast . To our knowledge, no western blot analysis of placental ERα expression has been previously described. During the third trimester, and after 34–36 weeks of pregnancy in particular, the placenta may develop an abnormality, often classified as placental aging [19–24]. These abnormal placentae are characterized by generalized interstitial fibrosis and fibrinoid degeneration of villous stroma, and are associated with cellular apoptosis and congestion of villous sinusoids [24–27]. Immunohistochemically, villous abnormality is associated with progressive diminution of Thy-1 differentiation protein in the villous core . Marked changes in villous structure are particularly associated with advanced maternal age [29, 30]. We have recently reported that, with respect to the Thy-1 expression, compensatory dilatation of villous sinusoids, and placental expression of low molecular weight cyclin E variants, the term placentae can be classified into four placental types (PT1–PT4) , where PT4 corresponds to the most severe placental abnormality. These observations indicate that the term placenta is not a constant structure, either morphologically or biologically. Therefore, expression of certain placental proteins, including ERα, may vary. Upon immunohistochemical staining, ERα is predominantly localized to cell nuclei. However, positive staining of ERα in the cytoplasm can also be seen [31–33]. It has been reported that cytoplasmic ERα expression accompanied by a lack of nuclear staining is characteristic for immature cells, nuclear ERα indicates differentiating cells, and complete lack of ERα expression accompanies terminal differentiation of estrogen-sensitive cells . In addition, evidence for cell surface ERα expression has been recently presented . Trophoblast cells are usually separated and grown in media containing phenol red (PhR) . Phenol red is a weak estrogen with apparent biological effects, and the ERα binding affinity in Dulbecco's Modified Eagle's Medium (DMEM) is equivalent to levels of E2 as high as 0.45 nM . Although relatively low when compared to the E2 levels in pregnancy, this estrogenic binding affinity of PhR is close to that of E2 during the preovulatory peak [4, 5]. Therefore, we included studies with PhR+, PhR-/E2- and PhR-/E2+ media in order to determine the effect of estrogens on differentiation of cultured trophoblast cells (syncytium formation) derived from normal and abnormal placental types. Here we show for the first time that the ERα protein is expressed in normal and marginally abnormal placentae (normal placental types) but barely detectable in placentae exhibiting moderate and severe abnormality (abnormal placental types). However, all placental types showed distinct ERα expression in trophoblast cultures. Nuclear ERα expression was confined to the villous and tissue culture mononucleated trophoblast cells, but not syncytiotrophoblast layers. DMEM with PhR stimulated differentiation of trophoblast cells from normal placental types, but mid-pregnancy levels of E2 significantly enhanced differentiation of cultured trophoblast cells derived from both normal and abnormal placentae. Ten placentae from deliveries between 33 and 41 weeks of pregnancy were investigated. The source of placental tissue were women with normal and abnormal pregnancies admitted to the University of Tennessee Medical Center. Six additional cases were studied for the effect of E2 on trophoblast differentiation. Excluded were patients with blood transferable infections, e.g., hepatitis and HIV, and apparent ascendent placental infections. Frozen tissue samples of ovarian cancer (a tissue control for ERα expression) were obtained from NCI Cooperative Human Tissue Network, Columbus, Ohio. MCF-7 breast carcinoma cells were maintained as indicated previously , and utilized as a cell culture positive control. Rat kidneys for secondary antibody absorption were kindly supplied by Dr. Roberto Dominguez, Laboratory of Biology of Reproduction, Facultad de Estudios Profesionales Zaragoza, UNAM, Mexico DF, Mexico. The study was approved by the Institutional Review Board. An unusually detailed description of the methods utilized follows, since placental ERα expression is still a highly controversial issue. All chemicals, except where specified otherwise, were purchased from Sigma Chemical Co., St. Louis, MO. The processing of the placenta started within 30–60 min after delivery. Several 10 × 10 × 5 mm blocks of tissue were collected from different central cotyledons into cryomold biopsy vinyl specimens molds (Tissue-Tek Cryomold Biopsy, Miles Inc. Diagnostic Division, Elkhart, IN) and embedded in an optimum cutting temperature formulation of watersoluble glycols and resins (O.C.T. compound; Miles). The molds with specimens were frozen by floating on liquid nitrogen and stored at -80°C until use. Frozen tissues were sliced into 7 μm serial sections using a cryostat microtome with specimen retraction during return travel (Carl Zeiss Microm HM 505 E; MICROM Laborgeräte GmbH, Waldorf, Germany) and ten to twelve distinct tissue sections were placed on each slide. The slides were dried ~2 h at room temperature, fixed 5 min in acetone, dried 30 min, and stored at 4°C until immunoperoxidase staining was performed – within two to four weeks. Prior to staining, the slides were transferred in a cold room (4°C) into air protected boxes containing Drierite granules (W.A. Hammond Drierite Co, Ltd, Xenia, OH) to prevent water condensation, and the boxes with slides were equilibrated to room temperature before opening. Slides were incubated overnight (4°C) with affinity purified mouse anti-human ERα alpha monoclonal antibody (1:50; 5 μg/ml), clone h-151. This antibody was raised against a 14 residue synthetic peptide (RAANLWPSPLMIKR) based on the human estrogen receptor (residues 287–300), and reacts specifically with the activated 4S ERα alpha (StressGen Biotechnologies Corp, Victoria, BC). Another set of sections was similarly incubated with anti-human ERα monoclonal antibody (ready to use without additional dilution), clone ID5 (DAKO Corporation, Carpinteria, CA). As indicated by DAKO, this antibody reacts with the N terminal domain (A/B region) of the ERα receptor, but the antibody concentration is unknown (not disclosed by DAKO upon request). In immunoblotting, this antibody reacts with the ~67 kDa polypeptide chain obtained by transformation of E. coli and transfection of COS cells with plasmid vectors expressing ERα [31, 32]. We also used monoclonal mouse anti-human Thy-1 antibody (1:100; 5 μg/ml), clone F15-42-01  (Dr. Rosemarie Dalchau of the Institute of Child Health, University of London, London, England), for the determination of placental type (PT1–PT4, see below). Control staining consisted of substitution of primary antibody with PBS, or with 1:50 diluted (recommended by the vendor) anti-human CD3 monoclonal antibody, which is directed against the CD3 pan T cell marker (DAKO). This control staining was also used, since the CD3 antibody specifically stains rare fetal T cells in the placental villi only, but not other villous structures. After several washes in PBS (room temperature), the sections were incubated with peroxidase labeled secondary antibody – goat anti-mouse IgG and IgM, pre-absorbed with human serum (Jackson Immunoresearch, West Grove, PA), diluted 1:50 and absorbed with rat kidney homogenate as described . Tissue sections were processed further as described previously , including hematoxylin counterstaining of the nuclei. Evaluation was performed on a Leitz DM RB (Leica Inc., Wetzlar, Germany) microscope equipped with differential interference contrast and a DEI-470 CCD Video Camera System (Optronics Engineering, Goleta, CA) with detail enhancement. The video images were captured by CG-7 color frame grabber (Scion Corporation, Frederick, MD) supported by Scion Image public software developed at the National Institutes of Health (Wayne Rasband, NIH, Bethesda, MD), and ported to Windows XP, 2002 release (Microsoft Corporation, Redmont, WA). To obtain figure panels, the captured video images were copied into Microsoft® Power-Point® 97 SR-2 (Microsoft Corporation). Each image (including controls) was further copied into Microsoft Photo Editor 3.0 (Microsoft Corporation), and total saturation balanced (usually brightness 45, contrast 65) and optimized for peroxidase immunohistochemistry by decreasing the image's blue brightness and contrast (usually to 45) and blue gamma (usually to 0.83). For the purpose of statistical analysis in this study, the PT1 and PT2 placentae were coupled, since they can be considered as normal placentae capable of responding and fulfilling the demands of the growing fetus by compensatory villous development or expansion of existing mature villi . They were compared with placental types showing moderate and severe abnormality (coupled PT3 and PT4). For preparation of protein lysates from placental tissue and ovarian cancer for western blot analysis, including control Cdk2 and normal rabbit immunoglobulin immunoprecipitates (IP), 150 cryostat tissue sections (7μm) were collected into microcentrifuge tubes and lysed by adding ice-cold lysis buffer (20 mM Tris pH 7.5, 200 mM NaCl, 0.25% Nonidet P-40; 400 μl/100 mg of tissue sections) containing 1 mM sodium orthovanadate, 10 mM sodium fluoride, and 1 mM phenylmethylsulfonyl fluoride. After 15 min on ice, the lysates were sonicated using a SonicatorTM Cell Disruptor (Heat Systems-Ultrasonic, Inc., Plainview, NY) for 5 seconds, and centrifuged at 11000 × g for 20 min at 4°C. Supernatants were stored at minus 80°C. For western blot analysis, protein concentrations were determined by Bradford assay (Bio-Rad, Hercules, CA). Equal amounts of unboiled protein (42 μg) were loaded onto reducing 10% SDS-Tris-glycine polyacrylamide gels, transferred to nitrocellulose (Bio-Rad), and processed as described previously , with some modifications. Briefly, two identical membranes were washed in Tris-buffered saline containing 0.05% Tween 20 (TBST) and non-specific binding sites were blocked by immersing the membrane in blocking reagent (0.5% casein in TBST) for 1 hour at room temperature on an orbital shaker. After blocking, the membranes were briefly rinsed in two changes of TBST, and washed once for 15 minutes and twice for 5 minutes in fresh changes of TBST. One of two identical membranes was first subjected to overnight incubation (4°C) with blocking reagent only (control). Another (identical) membrane (second membrane) was incubated overnight (4°C) for ERα (clone h-151, 0.1 μg/ml) in blocking reagent. Next the membranes were washed and incubated with peroxidase labeled secondary antibody – goat anti-mouse IgG and IgM (Jackson Immunoresearch) diluted 1:2000 – for 1 hour at room temperature. Before staining, the secondary antibody was diluted 1:60 (5 μl/300 μl), absorbed with rat kidney homogenate (150 μg/300 μl) for 20 min, centrifuged and diluted to the final concentration 1:2000. This absorption eliminated any non-specific background. After incubation, the membranes were washed 1 × 15 min, 2 × 10 min and 4 × 5 min in fresh changes of TBST, and incubated for 1 hour in blocking buffer at room temperature. Bound antibodies were detected by a chemiluminescent detection system (ECL; Amersham Pharmacia Biotech, Piscataway, NJ) as recommended by the manufacturer's protocol. For exposure (1 min, 5 min, and up to 1 h) we used Kodak XAR film (Eastman Kodak, Rochester, NY). Next, the membranes were stripped in buffer containing 0.2 M glycine (pH 2.2. ), 0.1% SDS, and 1.0% Tween 20 for 45 min, washed, and reprobed with antibodies raised against other proteins of interest, e.g., the first membrane with ERα antibody ID5 (DAKO) and the second membrane with actin mouse monoclonal antibody, clone C4 (Boehringer Mannheim Corp., Indianapolis, IN) 0.25 μg/ml. As indicated above, the ID5 antibody is delivered ready to use for immunohistochemistry, yet the antibody concentration is unknown. For western blot analysis we diluted the ID5 antibody 1:50. Although the ID5 antibody identified a band similar to that detected by h-151, the staining was weaker (see Fig. 1). Therefore, higher ID5 antibody concentration might be required for optimum outcomes in western blot analysis. Reactivity of h-151 and ID5 monoclonal antibodies directed against human ERα in a western blot with lysates from fibroblast culture (FBC), MCF-7 breast carcinoma cells (MCF), trophoblast culture (TRC) and ovarian adenocarcinoma lysates (AOvCa). The h-151 shows a stronger and ID5 a weaker band at ~65 kDa. Cdk2 and rabbit IgG IP were utilized as negative controls for ERα antibodies. Staining for cyclin E, clone HE12 (PharMingen, San Diego, CA), served as a positive Cdk2 IP control. For Cdk2 IP, the Cdk2 (M2) affinity purified rabbit polyclonal antibody raised against a peptide mapping at the carboxy terminus of Cdk2 of human origin (Santa Cruz Biotechnology, Santa Cruz, CA) was utilized. Equal amounts (200 μg) of protein from each sample were immunoprecipitated with 0.5 μg Cdk2 antibody in 300 μl IP buffer (50 mM Tris, pH 7.5; 5 mM EDTA, 20 mM glycerol, 150 mM NaCl, 1% NP-40) and 25 μl protein A/G agarose beads (Santa Cruz Biotechnology) on an orbital shaker overnight at 4°C. For IP control, 0.5 μg of normal rabbit IgG was used instead of anti-Cdk2 rabbit polyclonal antibody. Immunoprecipitates were collected by centrifugation (11000 × g for 10 min at 4°C), washed three times with 500 μl TG-buffer containing 20 mM Tris, 250 mM NaCl, and 0.5% NP-40. For western blot analysis, IP were resuspended in 20 μl 2 × SDS/sample (Laemmli) buffer and the supernatants were resolved by SDS-PAGE. Cyclin E variants in Cdk2 IP were detected by probing with HE12 primary antibody (PharMingen), followed by goat anti-mouse IgG and IgM (Jackson Immunoresearch) secondary antibody conjugated with horse radish peroxidase, and visualized by a chemiluminescent detection system (ECL, Amersham Pharmacia Biotechnology) and autoradiography as indicated above. Next, the membranes were stripped and probed with h-151 ERα antibody as indicated above. 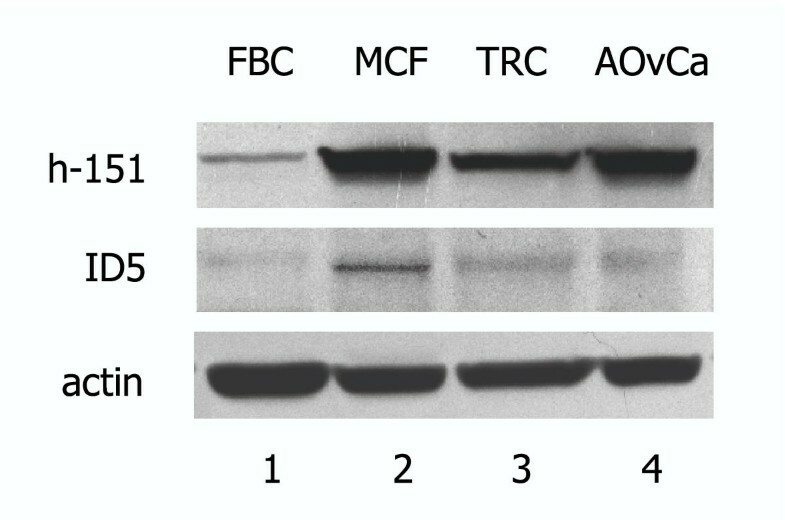 In parallel, the western blots with original protein lysates were processed – see Fig. 2. Reactivity of h-151 antibody [ERα (h-151), top row] with trophoblast culture (TRC) and ovarian endometrioid carcinoma (EOvCa) lysates in western blot (WB) and with rabbit anti-Cdk2 (lanes 3 and 5) immunoprecipitates (IP). Bottom rows show positive control with cyclin E antibody in WB (lanes 1 and 2) and Cdk2 IP (lanes 3 and 4). Lane 4 is a negative control for both antibodies. Placental tissue was digested and trophoblast cells isolated and cultured as described previously , with modifications. Since the first digestion yielded only erythrocytes and some white blood cells and in the second digestion such cells were accompanied by only rare trophoblast cells, the third supernatant was the first to be collected. The remaining tissue was incubated 30 min at 37°C in 50 ml of normal DMEM (PhR+) containing 25 mM HEPES and 4500 mg/L glucose (DMEM-HG), without trypsin and DNase . The supernatant was collected and the procedure repeated. Collected cells were pooled, washed twice in DMEM-HG, diluted to 10 ml in DMEM-HG supplemented with heat inactivated 5% fetal bovine serum (FBS; Gibco/BRL) and antibiotics (50 μg/ml gentamycin, 100 U/ml penicillin, and 100 μg/ml streptomycin), and viable large nucleated cells (95% in trypan blue exclusion test) were counted. The procedure gave between 30 – 40 × 106 viable trophoblast cells / 35 g of placental tissue. Cells were seeded in 60 mm Falcon Primaria petris (Fisher Scientific, Pittsburgh, PA), in the amount of 7 × 106 per dish cells in 3 ml DMEM-HG with 5% FBS + antibiotics as above, and cultured in an humidified atmosphere with 5% CO2 at 37°C. Cells were harvested for protein at 16–24 h (early cultures) and at 72 to 96 h (late cultures). The medium was changed every 24 hours. During cultivation the differentiation of syncytium from cytotrophoblast cells was monitored daily, and video images from several fields were stored in the computer for additional evaluation and presentation. To prepare cell lysates, cultures were washed twice with ice-cold PBS, lysed by adding ice-cold lysis buffer, and stored and processed for western blot analysis as indicated for tissue lysates above. Along with cultures in petri dishes, we established cultures in LabTek II 4-well glass slides (Nalgene Nunc International, Naperville, Illinois). The slide chambers were pre-coated with 80 μg/ml of calf skin collagen dissolved in 0.15% NaCl with 50 μg/ml gentamycin. Slides were incubated with 500 μl of collagen solution per chamber for 72 h at 37°C, dried for 2 h in an air flow box, and stored in the original (UV sterilized and air protected) package at 4°C prior use. The slide chambers were seeded with 4 × 105 cells per well, and utilized for immunohistochemical evaluation of ERα expression during trophoblast differentiation (Fig. 4). 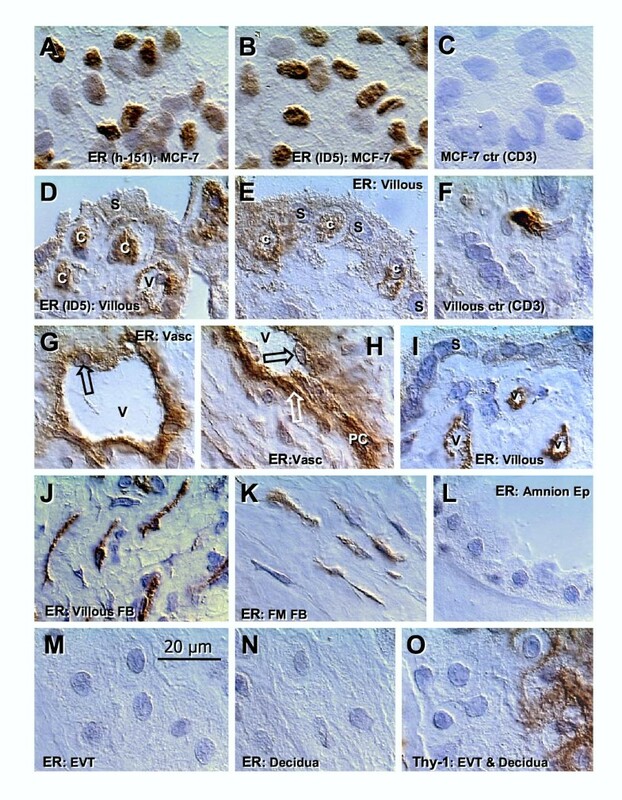 Immunohistochemical detection of ERα in MCF-7 cells and human placenta at term. A proportion of MCF-7 breast carcinoma cells show strong nuclear staining with h-151 [A] and ID5 antibodies [B]. [C] No staining of MCF-7 is apparent with control (CD3) antibody recognizing human T lymphocytes. [D] In normal placentae, cytotrophoblast cells (c) associated with trophoblastic syncytium (s) show strong nuclear staining with ID5 antibody (used for all placental samples stained for the ERα), which decreases in cytotrophoblast cells entering the syncytium [E]. [F] CD3 control shows an isolated T cell but no staining of other villous structures. Vascular ERα immunoreactivity is not associated with the nuclei of endothelial cells (black arrows, G and H). However vascular pericytes (PC and white arrow, H) are strongly stained. [I] In abnormal placentae, the ERα immunoreactivity was associated with villous vasculature only. [J] Staining of villous fibroblasts persisting after vascular regression. Fibroblasts beneath the amniotic epithelium show ERα staining [K], but no ERα immunoreactivity is apparent in the amniotic epithelium [L], extravillous trophoblast (EVT) [M] and decidual cells [N]. [O] Strong Thy-1 staining of decidual cells (right) and no staining of EVT (left). ERα immunoreactivity (h-151 antibody) in early (17 h) and late trophoblast cultures (93 h). Dividing cells in [A] exhibit distinct surface staining (arrow). Cell in [B] shows moderate cytoplasmic and perinuclear immunoreactivity (arrowhead), and cell in [C] exhibits strong nuclear staining without surface expression. [D] Early syncytium shows traces of cytoplasmic ERα staining (compare with E). [E] No ERα staining of mature syncytium. Amnion was carefully separated from the chorion laeve, placed into dry petri dishes with epithelium facing the bottom, allowed to adhere in the incubator for 1 h at 37°C, cut into narrow strips, and incubated for seven to nine days in the same medium used for trophoblast cultures, with daily monitoring of fibroblast outgrowth. The amnion was then removed and fibroblasts harvested after reaching ~80% confluence, and processed for western blot analysis. Some fibroblasts were passaged as described for other cell types , seeded onto four-chamber slides, allowed to reach similar confluence, and processed for immunohistochemistry with primary antibodies to fibroblast markers. All cells exhibited staining for Thy-1 fibroblast differentiation protein, vimentin and alpha actin, and no staining with leukocyte common antigen antibody (negative control) – data not shown. Scanned ERα bands from western blots were imported into the Paint Shop Pro version 5.0 (Jasc Software, Inc., Minneapolis, MN), saved in Windows Bitmap, and loaded into Scion Image (Scion Corporation). Loaded images were enlarged 16 ×, and six 40 square pixel rectangle areas were measured above (background) and within each band (crude values). The measurements were copied into Microsoft Excel 2002 (Microsoft Corporation), and background values subtracted from crude measurements to obtain net optical density (O.D.). Net values were utilized for statistical calculations. Extent of syncytium formation in PhR and E2 experiments (see next paragraph) was evaluated by a measurement of the area occupied by individual clusters. The video images of clusters in tissue cultures (six representative fields per time/data point) were saved in Windows Bitmap, and loaded into Scion Image (Scion Corporation). Individual clusters were encircled using free hand tool, and the area of each cluster measured. Clusters exceeding the view area (90000 sq μm) were evaluated as the maximum area size (90000). Measurements of six clusters were utilized for statistical evaluation of each culture at a given time. Six additional cases were studied for the extent of syncytium formation under various estrogen influences. Cells were grown in complete DMEM-HG, which contains 45 μM phenol red (PhR+). Phenol red binds to the ERα with an affinity 0.001% that of E2 (100%) . Hence, the binding affinity of 45 μM PhR is equivalent to 45 μM × 10-5, i.e. 0.45 nM E2. Other media were phenol red-free DMEM-HG without estrogens (PhR-/E2-), or phenol red-free DMEM-HG with 20 nM E2 (PhR-/E2+). This concentration of E2 corresponds to mid-pregnancy E2 levels . Each medium was supplemented with 5% heat-inactivated FBS. The PhR-/E2+ medium was prepared as previously described . Samples were harvested at time 0 (just after separation of cells), and from the early (16–24 h) and late cultures (72–96 h). Statistical analysis of data was performed using GraphPad InStat version 3.01 for Windows software (GraphPad Software, San Diego, CA). For evaluation of ERα expression density, the net O.D. values were transformed (Y = Log [Y]) and subjected to Kruskal-Wallis Test (Nonparametric ANOVA), followed by Dunn's Multiple Comparisons Test. Probability values of P < 0.05 were considered significant. Area of syncytial aggregates was similarly evaluated. Figure 1 shows ERα protein expression at ~65 kDa detected with two ERα monoclonal antibodies in an amniotic fibroblast culture (FBC, lane 1), MCF-7 cells (MCF, lane 2) and a trophoblast culture (TRC, lane 3). The last lane is from an ovarian adenocarcinoma tissue sample (AOvCa). Since the h-151 antibody clone gave a stronger reaction, it has been utilized in western blot analysis throughout the remainder of this study. In Fig. 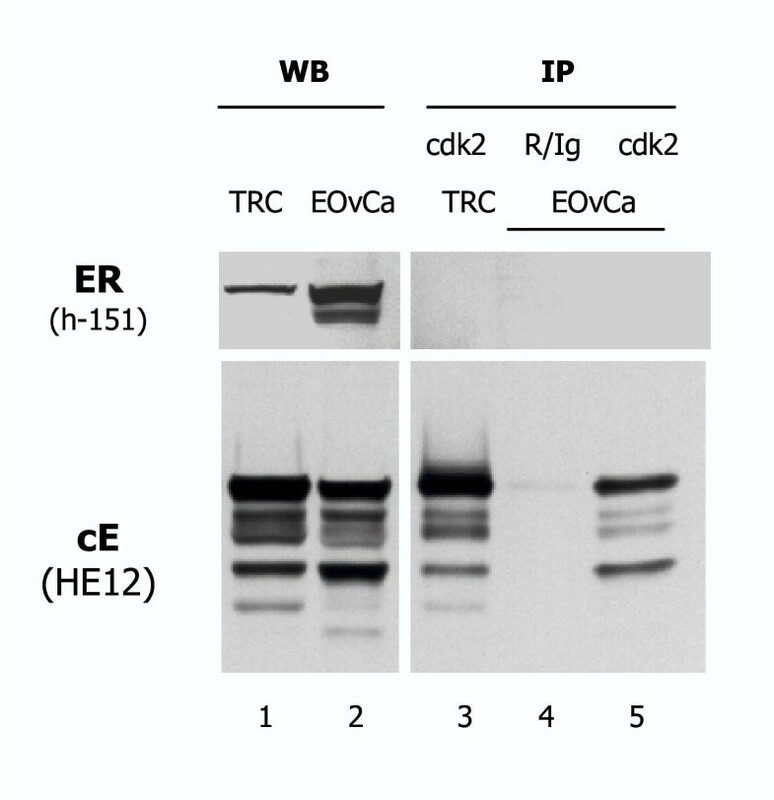 2, the h-151 antibody identifies an ERα band in cultured trophoblast cells and ovarian endometrioid carcinoma (EOvCa) lysates (lanes 1 and 2), but no reactivity is apparent in rabbit anti-Cdk2 IP (lanes 3 and 5). The HE12 anti-cyclin E antibody was utilized as a positive control for Cdk2 IP. Immunoprecipitate with normal rabbit immunoglobulin (lane 4) served as a negative IP control. Semi-quantitative correlation of placental types with Thy-1 expression, morphology of villous sinusoids and expression of cyclin E low molecular weight variants (cE LMW) for details and quantitative evaluation see Ref. , and ERα expression (this study) in normal (NP) and abnormal (AP) basic placental categories and placental types (PT1–PT4). aPT1, normal placental type, with occasional development of new mature villi or expansion of existing villi to fulfill the demands of the progressively growing fetus. Rarely, if there is no requirement for villous replacement or expansion, the ERα might not be expressed. bPT2, marginal irregularity, which can be interpreted as a compensation of imminent placental aging by enhanced development of new villi associated with expansion of existing mature villi and moderate dilatation of villous sinusoids. cPT3, placental senescence associated with the extreme dilatation of villous blood sinusoids and no compensatory villous development or expansion. dPT4A, placental hypertrophy – terminal villi persist in a young/immature state with compensatory development of additional young terminal villi (maternal diabetes mellitus associated with fetal macrosomia). ePT4B, placental atrophy – terminal villi persist in a young/immature state without compensatory development of additional young terminal villi (intrauterine growth retardation and poor Apgars). During the last trimester of human pregnancy, the placenta may exhibit pronounced abnormality associated with generalized villous degeneration, often called placental aging or senescence [22–24, 27, 43–45]. We have recently shown that placental abnormality is associated with the diminution of Thy-1 differentiation protein immunostaining in the villous core and less or more pronounced dilatation of villous sinusoids. Based on these two criteria, accompanied by changes in the expression of cyclin E (cE) low molecular weight protein variants, four basic placental types can be recognized (PT1–PT4, Table 1). Normal mature placentae, placental type 1 (PT1), show strong Thy-1 expression in the villous core, and relatively small lumen of sinusoids; expression of cE variants is low. The PT1 can be viewed as placenta capable of fulfilling the demands of the growing fetus (occasional villous regeneration and expansion of existing mature villi), without requirement of adaptive dilatation of villous sinusoids. Marginal irregularity, the PT2, is characterized by significant diminution of Thy-1 staining, and moderate but significant dilatation of villous sinusoids. Cyclin E expression is highest in this placental type. The PT2 can be viewed as placentae with villous and vascular adaptation to imminent placental aging (enhanced villous regeneration and expansion, accompanied by moderate dilatation of villous sinusoids). Placentae showing further diminution of Thy-1 expression and excessive dilatation of villous sinusoids are classified as PT3. Cyclin E expression is higher compared to PT1 but lower compared to PT2. The PT3 can be viewed as placentae exhibiting advanced aging, capable of compensating demands of the growing fetus only by extreme dilatation of villous blood sinusoids. Finally, in PT4, Thy-1 expression in terminal villi is very low, but this is not accompanied by dilatation of villous sinusoids. Cyclin E expression varies. The PT4 can be viewed as placentae exhibiting villous immaturity, either compensated by placental hypertrophy (villous regeneration and expansion without maturation – maternal diabetes mellitus; PT4A), or uncompensated (placental atrophy associated with villous immaturity – intrauterine growth retardation; PT4B) with apparent consequences for the newborn. Further details are given in Ref . Altogether, placental abnormality is not as simple as one might imagine, e.g. just placental aging. Table 1 shows that abnormal placentae include either advanced placental aging with an excess of villous blood sinusoid dilatation (PT3) or severe villous immaturity without significant dilatation of villous sinusoids (PT4). Again, the latter can be either compensated by placental hypertrophy (normal Apgars associated with fetal macrosomia in maternal diabetes; PT4A), or uncompensated (placental hypotrophy) and associated with intrauterine growth retardation and apparent deterioration of the Apgar scores  (PT4B). Note that the Table 1 also summarizes the data with respect to ERα expression showing either strong expression of ERα protein (PT1 and PT2) or only traces (PT3 and PT4). This supports a view that, regardless of pathophysiology, the intensity of in vivo ERα expression can be utilized for discrimination between the two basic categories only, the normal (NP; PT1 and PT2) and the abnormal placentae (AP; PT3 and PT4). Observations supporting this view follow. Possible exceptions for PT1 are indicated in Table 1 and in discussion. Figures 3A and 3B show that h-151 and ID5 anti-ERα antibodies exhibit similar nuclear staining of MCF-7 cells; no staining in the MCF-7 culture is apparent with control antibody recognizing CD3 of T cells (Fig. 3C). The immunoreactivity of ID5 antibody is shown in Fig. 3D, 3E, and G-N. In normal placentae, the ERα was strongly expressed in cytotrophoblast nuclei (c, Fig. 3D) lying beneath trophoblastic syncytium (S), which showed no staining of the nuclei. Fig. 3E shows that cytotrophoblast cells merging with the syncytium exhibit a diminution of ERα expression (compare with 3D). Such occasionally observed differentiation of cytotrophoblast cells was associated with weak cytoplasmic staining of the syncytium. Yet the syncytial nuclei never exerted ERα immunoreactivity (S, Fig. 4E). Control staining with CD3 antibody (Fig. 3F) shows an isolated T cell in the villous core, but no staining of other villous structures. Substitution of primary antibody with PBS produced no staining (not shown). In addition to cytotrophoblast cells, ERα immunoreactivity was also detected in villous vessels and sinusoids (v). However, this staining was not associated with the nuclei of endothelial cells (black arrows, Fig. 3G and 3H), but with adjacent pericytes (PC and white arrow, Fig. 3H), i.e. cells originating from placental fibroblasts. However, cytotrophoblast cells with nuclear ERα immunoreactivity were not detected in every placenta investigated. Fig. 3I shows an abnormal placenta with a lack of ERα staining except in the villous vessels. Fig. 3J demonstrates the ERα staining of small (resting) fibroblasts, persisting after vascular regression in some villi in the placenta shown in Fig. 3I. All placentae showed ERα staining of resting fibroblasts beneath the amniotic epithelium (Fig. 3K), but amniotic epithelium itself showed no immunoreactivity (Fig. 3L). Unexpectedly, no ERα immunoreactivity was found in extravillous trophoblast cells and adjacent decidual cells, either in chorion laeve (Fig. 3M and 3N) or at the placental basal plate (not shown). Fig. 3O shows staining for Thy-1 differentiation protein, which allows discrimination between unstained extravillous trophoblast cells (left) and Thy-1+ decidual cells (right). Note a lack of Thy-1+ fibroblasts among extravillous trophoblast cells. Figure 4 shows ERα immunoreactivity in early (17 h) and late (93 h) trophoblast cultures derived from normal placenta. In early cultures, the dividing trophoblast cells exhibited surface ERα expression (arrow, Fig. 4A). Non-dividing trophoblast cells showed cytoplasmic/perinuclear (arrowhead, Fig. 4B) or perinuclear/nuclear ERα immunoreactivity (Fig. 4C). The latter was accompanied by diminution of cell surface staining. Fig. 4D shows syncytium formation in the early culture, with traces of cytoplasmic (white arrowheads, compare with panel 4E) but no nuclear ERα immunoreactivity. Mature syncytia in late cultures showed no cytoplasmic or nuclear ERα immunoreactivity (Fig. 4E). Some late cultures derived from PT2 types showed a mixture of well developed syncytia and persisting mononucleated trophoblast cells with ERα immunoreactivity. However, in late cultures from abnormal placentae, the formation of syncytia was abortive (see below) and such small syncytia showed regressive changes and persisting cytoplasmic ERα immunoreactivity (not shown). A comparison of placental Thy-1 expression (PL in vivo: Thy-1) in normal (PT1, A) and abnormal placentae (PT4, D) and the extent of trophoblast differentiation (dashed lines) in early (EC) and late PT1 and PT4 trophoblast cultures (LC). Note that late culture from normal placenta shows a large syncytium aggregates (~300 μm in diameter). Abortive formation of syncytium clusters (~50 μm) is apparent in late cultures from abnormal placenta. Inserts show ERα (top) and actin bands (bottom) from western blots performed from the same cultures. [G] Quantitative evaluation of ERα expression in immunoblots shown in top inserts [A-F]. Different column superscripts indicate significant difference. Each column represents 6 measurements. Error bars = SD. Details in text. Figures 5 shows that trophoblast cultures from normal placentae, characterized by strong Thy-1 expression in the villous core (panel A), exhibit progressive formation of mid-sized (m) and large syncytial aggregates (l) in early (EC, panel B) and late cultures (LC, panel C). In contrast, trophoblast cultures from abnormal placentae, which are characterized by weak or no Thy-1 expression in the villous core (panel D), exhibit abortive formation of small (s) syncytial aggregates (panels E and F). The ERα expression in normal placentae is high (top of inset A), and transformation of cytotrophoblast cells into the large syncytia (~300 μm in diameter) is accompanied by ERα diminution (top insets B and C; see also Fig. 4E). On the other hand, abnormal placentae show almost no ERα expression in vivo (top inset Fig. 5D). However, strong ERα expression is apparent in early culture (top inset E), and persists thereafter (top inset F), apparently due to the lack of mature syncytium formation. Bottom insets show actin expression. Quantitative evaluation and statistical analysis of ERα expression in the placentae and trophoblast cultures are shown in Fig. 5G (error bars indicate SD). Nonparametric ANOVA was extremely significant (P < 0.0001). Dunn's Multiple Comparisons Test indicated a significant difference in ERα expression between normal placenta (PT1 in vivo) vs. corresponding late culture (PT1 LC), P < 0.01. Normal placenta (PT1 in vivo) showed significantly higher ERα expression when compared to PT4 in vivo (P < 0.001). Trophoblast cultures from PT4 showed a high increase when compared to the PT4 in vivo (P < 0.01) but there was no significant difference when the PT4 early and late cultures were compared. However, late PT1 culture (PT1 LC) showed significantly lower ERα vs. both PT4 cultures (P < 0.05). This correlated with differences in syncytium formation (Fig. 5C vs. 5F). 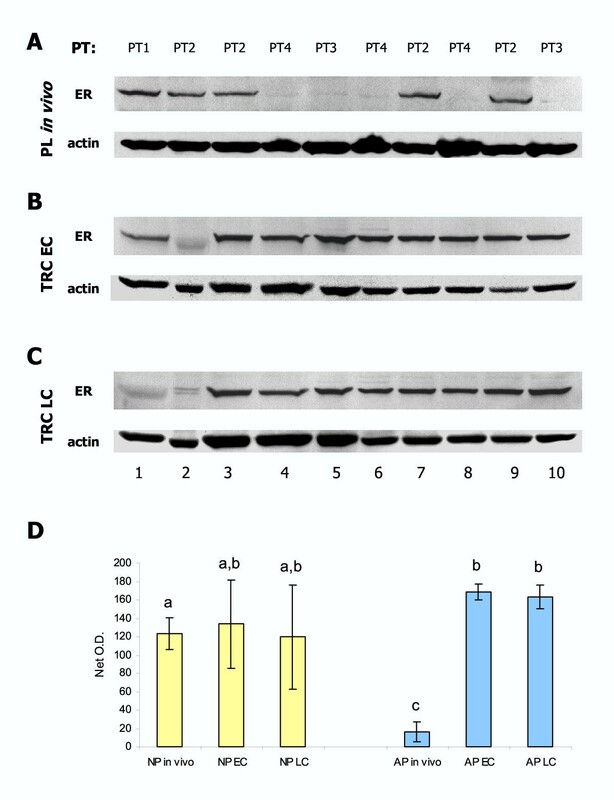 Estrogen receptor expression analyzed by western blotting in placental types PT1–PT4 [PL in vivo; A] and corresponding early (TRC EC) and late trophoblast cultures (TRC LC) [B and C]. Samples are presented in the order they have been collected. [D] Cumulative data on ERα expression in normal (NP in vivo; n = 5) and abnormal placentae (AP in vivo; n = 5) and derived early (EC) and late cultures (LC). Different column superscripts indicate significant difference. Each column represents 30 measurements. Error bars = SD. Details in text. In western blot analysis of the ten placental samples investigated, five showed a distinct ERα band at ~65 kDa and five exhibited barely detectable ERα expression (Fig. 6A). Note that in Fig. 6A, the placentae with strong ERα expression belong to the PT1 (normal) or PT2 (slightly abnormal) types, while placentae with low ERα expression belong to the PT3 and PT4 types (moderate and severe abnormality). For statistical purposes in this study, the PT1 (normal) and PT2 placentae (slightly abnormal with compensatory villous differentiation) were coupled as normal placentae (NP). The PT3 (moderate abnormality compensated by maximum dilatation of sinusoids) and PT4 placentae (severe abnormality without compensatory vascular dilatation) were coupled as abnormal placentae (AP). Figures 6B and 6C demonstrate ERα expression in early and late trophoblast cultures. Interestingly, the PT2 in lane 2 shows a diminution of ERα expression already at early culture, possibly due to the accelerated syncytium formation already activated in vivo . Fig. 6D summarizes the data on ERα expression in all ten placentae and cultures presented in panels 6A-C. It is apparent that high ERα expression in normal placentae in vivo was relatively constant, yet there were marked differences among trophoblast cultures, ranging from ERα diminution to persisting ERα expression. Indeed, only a small proportion of trophoblast cultures from PT2 placentae showed complete transformation of cytotrophoblast cells into the syncytia, while in others mature syncytia were accompanied by cytotrophoblast cells. Nonparametric ANOVA for Fig 6D was extremely significant (P < 0.0001). Dunn's Multiple Comparisons Test indicated significant difference in ERα expression between NP in vivo when compared to AP in vivo (P < 0.01). Estrogen receptor alpha expression in AP in vivo was also significantly lower compared to all other columns at P < 0.001. 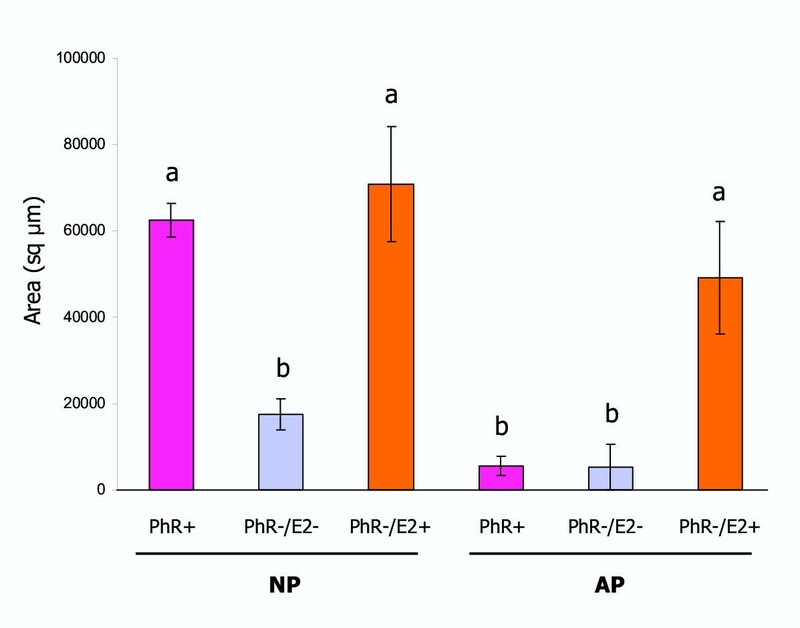 Interestingly, the ERα expression in AP early and late cultures significantly exceeded that of NP in vivo (P < 0.001). Altogether, very low in vivo ERα expression in all moderately and severely abnormal placentae rose significantly (several fold) in early cultures, and high expression remained unchanged in late cultures. This correlated with poor development of syncytial aggregates. Trophoblast differentiation in late cultures from normal (NP; PT1) and abnormal placentae (AP; PT3). Cells were grown in complete DMEM-HG, which contains 45 μM phenol red (PhR+), or phenol red-free DMEM-HG without estrogens (PhR-/E2-) of with 20 nM E2 (PhR-/E2+). Each medium was supplemented with 5% heat-inactivated FBS. *indicates vesicles and vacuoles characteristic of multinucleated syncytiotrophoblast ; s, small; m, mid-sized; l, large; xl, extra large syncytial aggregates (dashed line). Short arrows = dividing/post-mitotic trophoblasts; long arrow, adjacent trophoblast cells with preservation of cell membranes; arrowhead, isolated trophoblast cells. Details in Materials and Methods and in the text. Mean area (square μm + SD) of syncytial aggregates in late cultures of trophoblast cells derived from normal (NP) and abnormal placentae (AP). Cells were grown as indicated in Materials and Methods – see also Fig. 7 for details and abbreviations. Each column represents eighteen measurements. Different column superscripts indicate significant difference. Trophoblast cultures from six additional term placentae were studied for trophoblast differentiation in normal DMEM-HG medium with phenol red (PhR+), in phenol red-free medium without E2 (PhR-/E2-), and in phenol red-free medium with 20 nM E2 (PhR-/E2+). Three placentae were classified as normal (two PT1 and one PT2), and three as abnormal (two PT3 and one PT4). All time 0 (freshly isolated) trophoblast cells and early cultures showed distinct ERα bands, regardless of the absence (E2-) or presence of E2 or PhR in the media during trophoblast separation, and regardless of their origin from normal or abnormal placentae. Late cultures showed lower ERα expression in cell lysates from normal placentae when compared to that from abnormal placentae (data not shown). Trophoblast cells from normal placentae cultured in PhR+ medium formed mid-sized syncytial clusters in early cultures and large syncytial clusters in late cultures (l, Fig. 7A, see also Fig. 5B and 5C). The same cells cultured in PhR-/E2- medium showed a retardation of syncytium formation in early and late cultures, where they did not exceed clusters of small size (s, Fig. 7B). Trophoblast cells divided (short arrows) and associated together, yet often without fusing (long arrow, Fig 7B). However, PhR-/E2+ medium caused marked acceleration of trophoblast differentiation in early cultures, where the syncytial clusters already reached a large size. In addition, late cultures showed formation of extremely large syncytial aggregates (xl, Fig. 7C). Trophoblast cells from abnormal placentae (AP) cultured in PhR+ medium formed small syncytial clusters in early cultures and rare mid-sized clusters in late cultures (m, Fig. 7D, see also Fig. 5E and 5F). The same cells cultured in PhR-/E2- medium showed severe retardation of syncytium formation in early and late cultures (Fig. 7E). However, PhR-/E2+ medium stimulated trophoblast differentiation in early and late cultures, where syncytial aggregates reached a large size (Fig. 7F). Fig. 8 summarizes the data on the extent of syncytium formation in late trophoblast cultures from three NP and three AP studied. It is apparent that PhR+ media stimulated syncytium formation in NP but not AP. Lack of estrogens (PhR-/E2-) caused retardation and E2 supplementation stimulated syncytium formation in trophoblast cultures derived from both normal and abnormal placentae. Nonparametric ANOVA for Fig 8 was extremely significant (P < 0.0001). Dunn's Multiple Comparisons Test indicated significant differences in ERα expression at P < 0.01 as indicated by different column superscripts in Fig. 8. Note that the measurement of extra large syncytium aggregates in NP PhR-/E2+ (see xl, Fig. 7C) was limited by a maximum view area representing 90000 sq μm (see Materials and Methods). Altogether, E2 appears to stimulate terminal differentiation of trophoblast cells derived from normal and abnormal placentae (both expressing ERα in vitro) and to enhance a fusion of syncytial clusters into extremely large aggregates. The presence of phenol red, a weak estrogen, in the culture is sufficient to stimulate differentiation of trophoblast cells into large syncytia in cultures from normal placentae, but not from abnormal ones. This is the first demonstration of ERα protein expression in human placentae by western blot analysis. 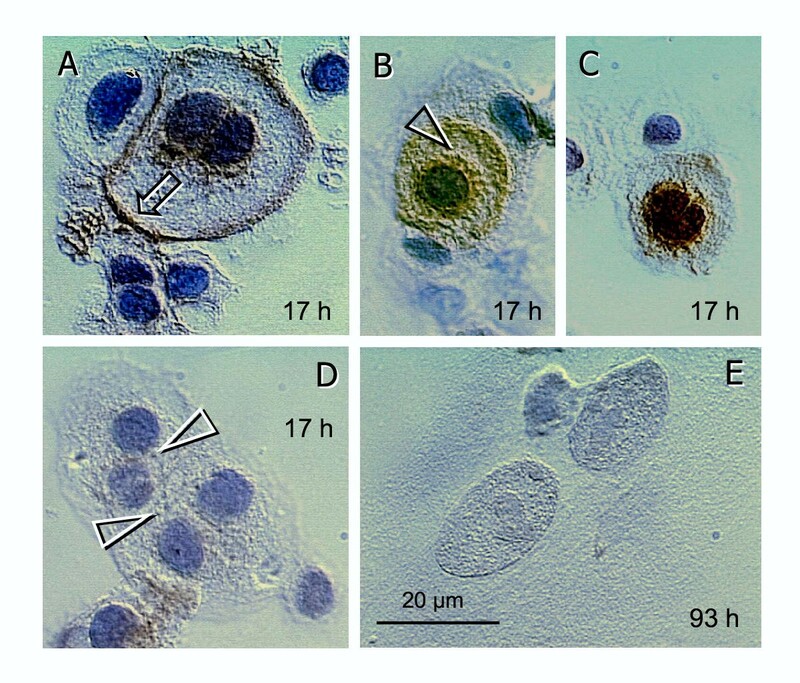 Nuclear ERα expression was confined to the villous mononucleated trophoblast cells associated with trophoblastic syncytium and differentiating cultured cytotrophoblast cells. No nuclear ERα staining was detected in trophoblastic syncytia in vivo or in vitro. Unexpectedly, extravillous trophoblast cells also lacked ERα. These observations indicate that trophoblastic nuclear ERα expression is characteristic of cytotrophoblast cells differentiating into syncytial structures, but not for resting cytotrophoblast cells. Additional placental cell types expressing the ERα were fibroblast-derived vascular pericytes and extravillous (amniotic) fibroblasts. Estrogens may, via the ERα, contribute to the stimulation of terminal differentiation of mononucleated trophoblast cells into syncytial aggregates. Terminal trophoblast differentiation is associated with diminution of ERα expression. Nuclear ERα expression is characteristic of estrogen-sensitive cells, which might be stimulated by estrogens to proliferate as well as modulate differentiated functions. In placental material ERα expression determined by western blot analysis showed either strong ERα or barely detectable ERα bands, and where investigated, there were no transitions between these two types of ERα expression. In addition, strong ERα expression was associated with normal placentae (PT1 and PT2), suggesting that in these term pregnancies ERα+ cytotrophoblast cells contribute to syncytium differentiation. On the other hand, placentae exhibiting moderate and severe abnormality showed virtually no ERα expression by western blot analysis or immunohistochemical staining of tissue sections (except the vessels). This indicates there is no syncytium differentiation, although the senescent placentae of females of advanced maternal age were reported to exhibit a higher number of Ki-67 (dividing) mononuclear trophoblast cells . These observations suggest that dividing cytotrophoblast cells do not necessarily contribute to syncytium differentiation and may not express ERα. An unexpected feature was the strong ERα expression of cultured trophoblast cells derived from placentae deficient in ERα expression in vivo. This observation indicates that the lack of ERα expression in vivo is not due to the inability of trophoblast cells to express ERα in general. It might be speculated that under conditions of tissue culture factors modulating ERα expression are different from that in vivo. Given that ERα expression is already enhanced at the end of the cell separation (time 0), ERα expression appears to be inhibited in vivo. Virtual lack of in vivo ERα expression seems to be an additional indicator of moderate and severe placental abnormality. Based on in vivo ERα expression, the placentae may be divided into the two basic categories, normal placentae: NP, ERα+, and abnormal placentae: AP, ERα-. However, it should be considered that some PT1 placentae, the functions of which are in harmony with actual fetal demands, may not exhibit compensatory differentiation of trophoblast cells and, therefore, may not express ERα in vivo (Table 1). The existence of placental aging is still debated, yet various clinical, morphological, cellular and molecular aspects of placental senescence have been indicated [20, 21, 24, 25, 27–30, 45–47]. However, it is still unclear if there are any consequences of placental aging for normal pregnancy, delivery, and neonatal birth weight and Apgar scores [29, 48, 49]. It has to be noted that even the abnormal placenta may have the capacity to improve its function and compensate for demands of the growing fetus, e.g., by elongation and excessive dilatation of villous sinusoids [26, 50]. As recently indicated , certain types of placental abnormality have also been ascribed to the villous immaturity (low or no Thy-1 differentiation protein expression in placental villi and a lack of blood sinusoid dilatation – PT4, see above) accompanied by an existing (diabetes mellitus) or absent placental hypertrophy (intrauterine growth retardation) – Table 1. However, it has been suggested that although chronic placental adaptations may be successful for the fetal survival, e.g. in placental senescence or maternal diabetes, they may lead to adverse outcomes later in the life of an individual . Therefore, although it might not be apparent in the newborn, the abnormal placenta may indicate a burden for the future of an individual and for the quality of the human population. Yet, placental abnormality is not a rare event, since it has been found in 50% of the cases in our material. The second cell type expressing the ERα were amniotic fibroblasts and fibroblast-derived vascular pericytes. Estrogen receptors have been identified in cultured fibroblasts of various origins and vascular smooth muscle cells [51–53]. Estrogens enhance proliferation of fibroblasts and inhibit vascular smooth muscle migration [54, 55]. Binding of estrogens to fibroblasts also stimulates fibroblast interaction with epithelial cells with subsequent acceleration of maturation of epithelial cells . The last observation is of particular importance to several aspects of this study. Activated Thy-1+ villous fibroblasts, characterized by secretion of Thy-1 differentiation protein among epithelial cells in vivo and among cultured trophoblast cells in vitro [57, 58], are present in PT1 and PT2, but absent from PT3 and PT4 placentae  (see also Fig. 5A vs. 5D). Various types of placental mesenchymal cells inevitably accompany "purified" trophoblast cells , and highly activated Thy-1+ fibroblasts are present in early trophoblast cultures . Extravillous trophoblast cells do not express ERα, yet indeed, there are no Thy-1+ fibroblasts among the basal plate and chorion laeve extravillous trophoblast cells (see Fig. 3O). Hence, Thy-1+ fibroblasts may stimulate differentiation and ERα expression in mononucleated trophoblast cells. Although estrogens were suspected to stimulate trophoblast differentiation [12, 59], no direct proof has been provided up to date. 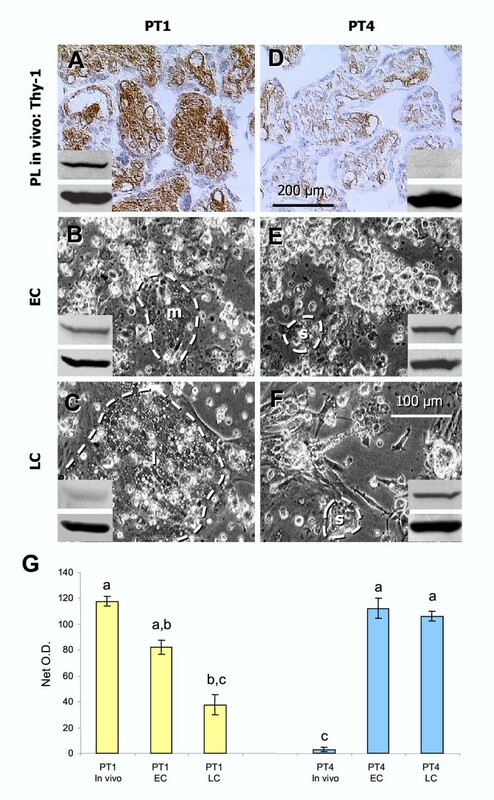 Trophoblast cells derived from normal placentae differentiated into large syncytial clusters in the presence of PhR without E2 supplementation. Phenol red in tissue culture media is a weak estrogen, sufficient to stimulate the proliferation of ERα+ MCF-7 human breast carcinoma cells . We report a similar estrogenic effect of PhR+ media on trophoblast differentiation and syncytium formation in cultures from normal placentae, but not from abnormal ones. Because trophoblast cultures derived from both the normal and abnormal placentae were ERα+ in time 0 cell lysates, the above difference can not be ascribed to the lack of ERα expression. Yet, ERα at mid-pregnancy levels further stimulated syncytium development, as evidenced by the development of extremely large syncytial aggregates in late cultures from normal placentae, and development of large syncytial aggregates in cultures from abnormal placentae. Hence, trophoblast cells from abnormal placentae are also capable of differentiating in response to estrogenic stimuli, but the level of estrogens must be higher. However, it is important to note that pharmacological levels of E2 (200 nM) have been found to suppress development of syncytial aggregates even in cultures derived from normal placentae (unpublished data). Hence, either low or extremely high levels of estrogens in vivo may cause a suppression of placental syncytium formation. Our observations indicate that the cultures from normal and abnormal placentae contain similar trophoblast cells capable of differentiating in response to exogenous estrogens, but they may differ in the ability of accompanying mesenchymal cells to promote this process. One might speculate that in cultures derived from normal placentae, the weak estrogenic effect of PhR is sufficient to stimulate trophoblast/mesenchymal cell interactions in vitro resulting in a local production of estrogens. It is possible that the estrogens can be secreted by the syncytiotrophoblast clusters and fibroblasts, because these cell types express the enzyme aromatase . Indeed, trophoblast cultures are capable of producing estrogens . The data are summarized in Table 2. Our observations rise a fundamental question if E2 is not, in fact, an essential input for trophoblast differentiation. Yet, previous experience has shown that lower estrogen levels during pregnancy are indicative of poor fetal condition . 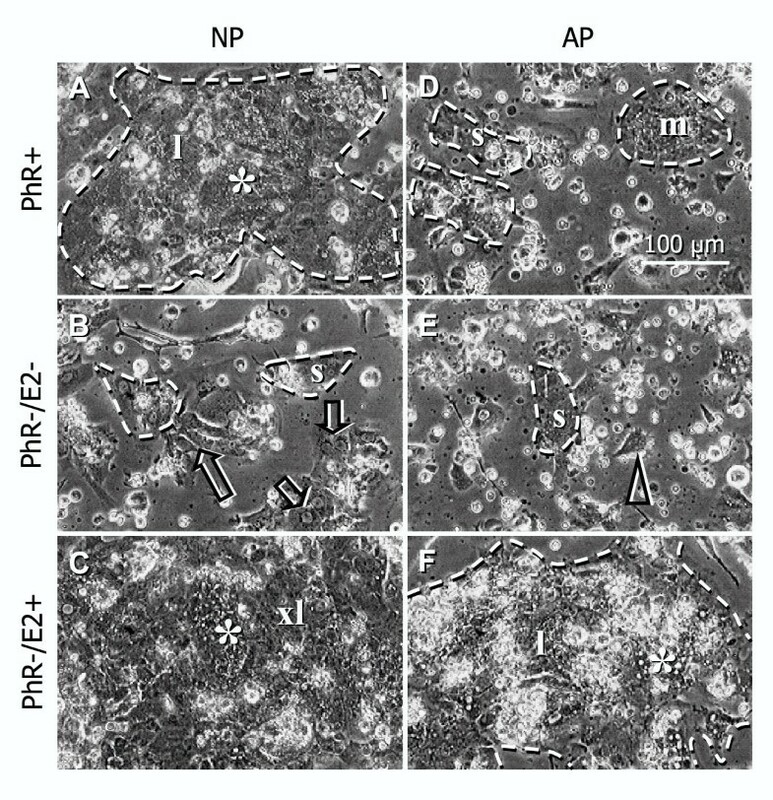 Summary of observations on normal (NP) and abnormal placentae (AP) and derived trophoblast cultures: ERα expression in vivo and in vitro, and formation of large syncytial aggregates in late trophoblast cultures under PhR+, PhR-/E2- and PhR-/E2+ conditions. Placental ERα expression in vivo is high in normal placentae and barely detectable in abnormal placentae. The significant increase of estrogen production occurring with pregnancy advancement may play a role, via the ERα, in the stimulation of terminal differentiation of mononucleated trophoblast cells into syncytial aggregates and promote placental function. This mechanism, however, may not operate in abnormal placentae, which show a lack of ERα expression. Supported by Physician's Medical Education and Research Foundation grant #93040, Knoxville, Tennessee, to A.B.